OK-SAFE, Inc. – One can sometimes find interesting things at estate sales. One such find was the recent discovery of a slim magazine entitled The Northwest Technocrat, NO. 119, Vol. X, which originally sold for 15 cents. Published in 1946 by Technocracy Inc., and showing an address of 9108 Woodward Ave., Detroit 2, MICH., the cover of this edition features a black and white photo of a fire truck – apparently evidence of the advancements in the design of fire truck technology. Featuring such articles as Why Not Eat Cake?, Here’s to Health!, Fire!, Science for Sale, and Developing Trends, the magazine included a A Letter to Manchester Boddy. This short letter-to-the-editor piece questioned why articles about Technocracy had ceased to appear in Boddy’s Los Angeles paper, The Daily News, after that paper had been such a strong advocate earlier? “Now, Mr. Boddy, since you once publicly proclaimed that Technocracy has the answers and that it was ‘little less than treason’ for the ‘men on the inside’ to withhold information on Technocracy, and since you, yourself, for several months used material on Technocracy as front page stuff, why then is Technocracy no longer mentioned in your paper? Can you tell me why a scientific balance between production and distribution, as long proposed by Technocracy Inc., is any less correct and necessary today than you openly admitted it was in 1932 and 1933? In view of the fact that your paper claims to be the outstanding liberal newspaper in Los Angeles, I expect your prompt reply, editorially and otherwise. 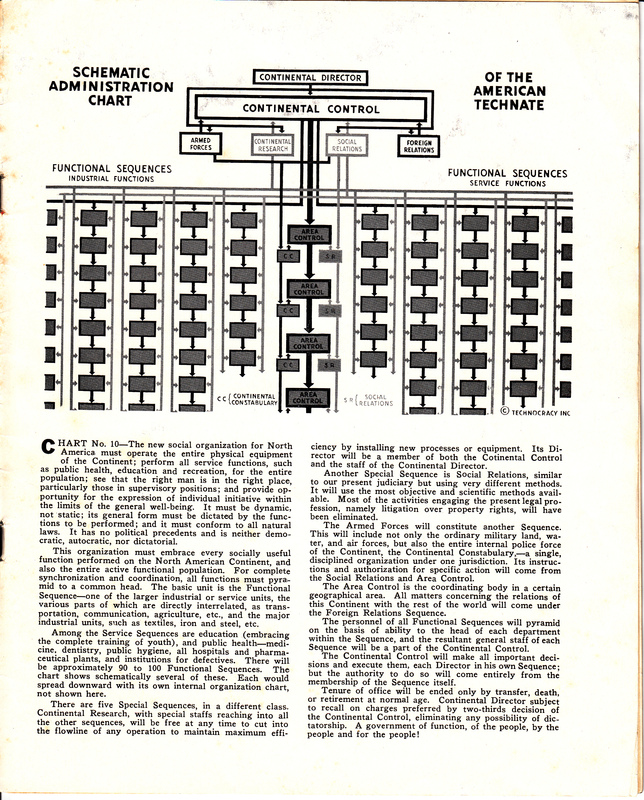 Page 23 featured the graphic “Schematic Administration Chart of the American Technate”, the chart detailing the structure for the Administrative control over the “functional sequences” associated with with all the physical equipment of the Continent, (industrial production, consumption and distribution) and the service functions (public health, education and recreation). This administrative structure was to be overseen by a Continental Control, who reported to a Continental Director. This chart defines the structure for a proposed “new social organization for North America.” Most people would clearly see this as a set up for tyranny, but not the Technocrats. These rational “science-based” technocrats believed that if experts – i.e. non-political experts such as themselves – oversaw all the functions of production and distribution, if they managed to efficiently regulate and control energy usage across the entire North American Continent, if they oversaw the entire social order, matching worker to task and providing the basic necessities of life (and threw in some recreation and entertainment) – there would balance in the world and everyone would be happy, satisfied and content. Technocrats believed that these rational “science-based” experts would not abuse their authority or tyrannize the people. Reading any of the material put forth by Technocracy Inc. one senses foreshawdowing of that political agenda known as sustainable development, aka Agenda 21. See our prior post entitled What is Technocracy? and click on the Technocracy Study Course text to see evidence of this idea. It is entirely possible that the social organization as envisioned by these early technocrats laid the groundwork for future sustainable development policies. At the very least, technocratic ideas helped pave the way for an agenda based on ‘scarcity’, an agenda that is orchestrating a systematic reduction in standards of living here and elsewhere. Technocracy Inc. made it clear that as the advancements in technology occurred, and the means of production became more streamlined, fewer and fewer people would be needed to do the work. (People being replaced by machines or by computers). This means an increase in unemployment virtually everywhere. A reduced need for workers translates into an overall reduction in the need for people in general. So how to deal with the excess population? How about promoting the idea that the world is over-populated, and that man has caused global warming? Eliminate God and God’s plan for people from public discussion, and develop schemes and policies that favor single lifestyles, childless marriage and smaller families. Make abortion legal and readily available. Plan densely packed communities, and squeeze people into smaller and smaller dwellings, making it harder for them to have a family. Make it more difficult and expensive to own property or have a car. Promote a culture of death by creating a health care system that can unplug the elderly or infirm because they are no longer productive, cost too much or are using too many resources, etc. If the papers had quit publishing information about Technocracy, how were the ideas and concepts of Technocracy being spread around the country? Apparently by means of magazines such as The Northwest Technocrat and the establishment of chartered Sections of “units and members” all across the country. This is reminiscent of how so many Rotary Clubs, America Legions and Masonic Lodges were established in small towns across the U.S. in the early 20th century. Membership was open to almost anyone in North America – except “Aliens, Asiatics and politicians are not eligible.” Oh, those rascally politicians. There is evidence to suggest that there is a rising technocracy of sorts, here in the U.S. and elsewhere. If so, this means the end of life, liberty and the pursuit of happiness, meaning property; the end of country, home and hearth. A Technate recognizes no borders or boundaries, and seeks to have global control of all the earth’s natural resources and people. It aims to dictate how we people live and where, and how many of us there should be; a technate does not acknowledge God’s plans for His people. For more information on this subject visitthe August Forecast & Review website or see posting on the OK-SAFE website. *ENDNOTE: Most of the articles featured in The Northwest Technocrat were signed by individuals, who followed their names with a six-digit number (five number, hyphen, single number). In the Technocracy Study course, the Continent was to broken up into Regional Divisions, determined not by country or state boundaries, but by latitude and longitude. An individual’s Regional Division number was determined by adding up the bisecting points of the southeast corner – i.e. 11833-2. Think of it as early GEO tagging. OK-SAFE, Inc. – See the post below from our friend Terri Hall of Texas TURF. At issue is the resurgence of the Trans-Texas Corridor, sometimes referred to as the NAFTA Superhighway, and the promotion of triple P’s – Public-Private Partnerships. Click here to read the entire article by Terri Hall. Click here to read OK-SAFE’ s position paper on PPPs. Some have tried to convince the public that the Trans Texas Corridor and NAFTA Superhighways are dead. But Congress recently passed a new, two-year federal highway bill, Moving Ahead for Progress in the 21st Century (or MAP-21), that not only gives priority funding to these ‘high priority’ trade corridors, it also makes it easier to hand them over to private corporations using controversial public private partnership (P3) toll contracts. On July 6, President Barack Obama signed MAP-21 into law. As with most bills these days, Congress had to pass it in order for us to know what’s in it. Only the committee members, conferees, and lobbyists had the access to know precisely what was in it, and big business, big energy, and various and sundry special interests got just what they wanted — including state highway departments that got the environmental rules so relaxed, they can literally add toll lanes to any highway without so much as a public hearing or ANY study of the impacts, so long as it’s within the existing right of way. Does it have-ta be NAFTA? Americans have seen their jobs exported for two decades, and many argue NAFTA is what started the downward spiral. Though most high tech jobs have gone to Asia, U.S. manufacturing got outsourced to Mexico, and eventually to China, too. Even American agriculture is feeling the effects of NAFTA. You can drive through the San Joaquin Valley in California even now and see signs along what used to be a booming farm community criticizing Senator Barbara Boxer for using arcane environmental policy to destroy farmers’ ability to grow food in order to quietly enforce NAFTA’s import/export mandates. Ditto for the Mexican trucking program that drew loud U.S. protests during the Bush Administration from truckers and those concerned with non-English reading drivers, smuggling, and illegal immigration, which Obama quietly approved in March 2011. In June 2011, the Texas Legislature repealed the Trans Texas Corridor (TTC), a 4,000 mile network of multi-modal toll roads, toll rail, toll truck lanes, as well as tolled utilities, telecommunications, and pipelines of all sorts — that would all fall under the control of a private, foreign corporation for a half century. 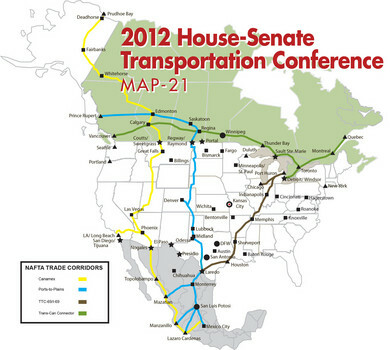 It was the most ambitious plan proposed of the NAFTA superhighways. The TTC would be gigantic, 1,200 feet wide, which is like four football fields end to end. Dubbed the biggest land grab in Texas history, it would be near impossible to traverse across or drive cattle or school buses under it, since the developer only had to build overpasses where it intersected existing interstates. On the first leg, there would have been only 4 exits through the entire state of Texas and it would have displaced one million Texans. Since the developer also got the exclusive rights to the land surrounding the toll and railways, it would be granted a state-sanctioned monopoly and the ability to charge concession fees and choose all the gas stations, hotels, and restaurants on this captive audience revenue-generating corridor. So the TTC would have effectively bisected whole communities, crushed economic development along the remaining private property adjacent to the tollway, as well as cut-off access to huge parcels of farmers and ranchers’ land, rendering the parcels virtually useless. The driving force behind Texas Governor Rick Perry’s ambitious plan was foreign trade — to accommodate the influx of what was initially thought to be goods from Mexico, but that soon got supplanted by even cheaper goods from China. The TTC’s primary purpose was to facilitate the free flow of people and goods across the border from the deep water port, Lazaro Cardenas, in Mexico into the interior of the U.S. and up into Canada. 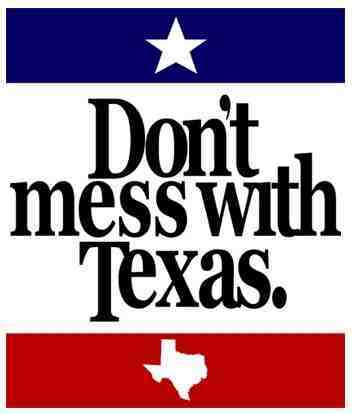 Texans immediately realized the threat to state sovereignty and property rights. They had a visceral reaction to having their land forcibly seized through eminent domain and handed to a foreign entity, Spain-based toll giant, Cintra. The more they learned, the less there was to like. A fairly new financing and development agreement for the time, a P3, would be the primary procurement method for the TTC, and it was all negotiated in secret. Neither the press nor the Texas Attorney General Greg Abbott were allowed to see it. Abbott had to sue the Texas Department of Transportation (TxDOT) just to get it released. The financial guts of the contract were still withheld until the eleventh hour prior to Perry’s re-election in 2006, under threat of yet another lawsuit — this time by property rights advocates. Texans discovered these P3 contracts included profit guarantees and non-compete agreements as well as financial incentives to manipulate speed limits to slow down the free routes and enhance speeds on the tollway. The non-compete clauses prohibit or penalize the state for the expansion of free alternative routes in order to ensure congestion on the free lanes and force more drivers to pay the toll. Rest of article Examiner dot com. What follows is the transcript of the speech given by Amanda Teegarden, Executive Director of OK-SAFE, Inc., in response to the above reading by Reid Mullins. 1. We have experienced the refusal by our elected officials to hear and advance legislation requested by “We the People” of their own home districts. Instead, these same officials have chosen to ridicule the people of their districts, manipulate the legislative process, make false statements about time constraints, ignore their own House rules, all the while justifying their actions. 2. Our Elected officials have advanced only that legislation which is advantageous to the interests of an elite group of corporations and organizations, particularly the members of the Chambers of Commerce and the Business Roundtable. These agents are actively engaged in directing the focus and intention of the state legislature, and it has become evident that the outcome of the legislative session is determined before the session even begins. 3. Our Elected officials, while claiming to be for limited government and reduced taxation, have worked to increase the size and scope of state government by implementation of something called Public-Private Partnerships. This corrupt ménage-a-trois is the model for the so-called New Economy – it marries Government with Industry and Academia. This European model is exclusionary in practice and is funded by the backs of the people in the form increased government spending and taxes, bonds, and tax credits for the government partners. 4. Our Elected officials have increased the financial burden of the people of Oklahoma by approving ever-increasing state budgets – now at a whopping $6.8 billion for 2012. 5. Our Elected officials have levied taxes in a stealth manner – calling them fees instead. One such fee increased by 300% in one fell swoop. Officials justified this action by stating that “the fee had not been increased in a while”. 6. Our Elected officials have continued to grow government by the establishment of an ever increasing number of A, B, Cs – Authorities, Boards, Commissions, and Trusts. These unelected bodies consist of people appointed from a small pool of political insiders. These entities meet in private, make rules that govern the rest of us, favor their friends with contracts. They are accountable to no one, and do not represent or serve the People of Oklahoma. These unelected bodies can solicit and receive federal grants, award contracts, issue bonds, and incur debt that the rest of us have to guarantee. One such entity is the Oklahoma Health Information Exchange Trust, or OHIET. Have you ever heard of the OHIET? They’re busy laying the foundation for “ObamaCare” in the state of OK, using Stimulus money and federal grants to do so, awarding contracts to companies their members have vested interests in. Authorities, Boards, Commissions, and Trusts are the unelected “fourth branch of government” – advancing the interests of the rich and powerful, not the people of Oklahoma. 7. Agents and Agencies of our State Government are busy Reinventing that traditional institution – transforming the state of Oklahoma from a representative Republic -a government of, for, and by the people – toward a “Governance” model. The state and its agencies are to be managed by a “technocratic elite” for the use and benefit of certain corporations and the progressives in both parties. This reinvention is being spearheaded by at least one recently instituted cabinet position – namely the Office of the Chief Information Officer. This agency is busy consolidating and concentrating power into the hands of a very few agents. Welcome to Government 2.0! Welcome to Technocracy! Governance by “Experts”! 8. This state has entered into information-sharing compacts that allow the transmittal of highly personal information about you – your health, school, and work, your life and lifestyle choices, how many fruits and vegetables you eat and whether or not you exercise. This information is being shared across jurisdictions, across state lines, with the federal government, and with others unknown to us. All without the people’s informed consent. And by refusing to pass the legislation that would have prohibited RFID tags in the OK drivers licenses! These meters serve to monitor every activity inside our homes. 12. Our Elected officials just this year put a cap on the use of freshwater in this state. Called the Water for 2060 Act, this law says that “the public policy of this state is to establish and work toward a goal of consuming no more fresh water in the year 2060 than is consumed statewide in the year 2012”; How are we to live, grow and prosper with such an egregious and arbitrary cap on freshwater usage? 13. Finally, our elected officials have been implementing, while denying that they are doing so, all the provisions of “ObamaCare” in the state of Oklahoma. They have allowed for the creation and advancement of an electronic health record on every single person, whether they wanted one or not. This electronic health record begins at birth with an electronic birth certificate, tracks us through school, into our work, and makes record of our lifestyle choices – virtually our every activity. This record continues until we’re dead, making “health care reform” truly cradle-to-grave. Health care reform allows for “human subject research” without the knowledge or the informed consent of the person. These electronic health records link the patient, the provider and the payer together – in a nationwide – correction! In a global health information network. Our Elected officials have continued to work to establish an “ObamaCare” insurance exchange in Oklahoma. These insurance exchanges completely redesign the insurance industry market and insert a middle man into the traditional business model. The end result will be increased costs for all of us. Our Elected officials have claimed that they can establish a “state-based exchange”, one that is different from the federal government’s version. What they are not telling the people is that there is only one way an exchange will work – and that is the federal way. Oklahoma has been laying the groundwork for this for years – is it likely they’ll abandon that now? Despite the people saying NO to the exchanges, there are still those who continue to press for their establishment in this state. OK-SAFE, Inc. – Amanda Teegarden, Executive Director of OK-SAFE and host of America in the Balance, will the fill-in host for Maggie Roddin on Republic Broadcasting Network, on Monday and Tuesday, July 9 & 10, from 9 am to 11 am (Central). Maggie’s show is entitled The Unsolicited Opinion. Amanda’s guests for Monday will be Chuck Untersee, producer of the recently released film entitled Behold a Pale Horse – America’s Last Chance. Chuck will talk about how and why this film was made and where we are as a country. Chuck will be followed by the award-winning journalist Vince Wade, who will be discussing the Chinafication of the U.S., how GM is becoming China Motors, and how our military technology is being hijacked. Tuesday’s guest will be Vicky Davis, former computer systems analyst, and independent researcher. (Unless she has jury duty!). Tune in and listen live. Call-in number is on their website. Letter To Governors – Don’t Build An Exchange! OK-SAFE, Inc. – This was forwarded by a friend in Idaho. A few key legislators have signed a letter urging the state Governor’s to reject Obamacare State Exchanges. Twelve Senators and 61 Legislators have signed the letter already – don’t you think OK Governor Mary Fallin should sign this letter, too? See below for details and a link to the letter. DeMint, Bachmann, Jordan Urge Governors to Reject Obamacare State Exchanges. (Washington, D.C.) Senator Jim DeMint (SC), Congresswoman Michele Bachmann (MN-06) and Congressman Jim Jordan (OH-04) sent a letter to all 50 governors urging them to oppose the implementation of the state health care exchanges mandated under President Obama’s health care law. Twelve Senators and 61 Representatives joined them in writing in opposition to these exchanges, which could cost businesses up to $3,000 per employee. “While Republicans in Congress will continue to push for a full repeal of Obamacare, the states can take immediate action to reject these exchanges that will increase health care costs and add more layers of bureaucratic red tape. I encourage all 50 governors to do what’s best for the American people. They should refuse to implement an exchange and instead work towards common sense solutions that lower costs and return important health care decisions to patients and their doctors,” said Bachmann. “The harmful impact on jobs is just one of many reasons we remain committed to fully repealing this law. If governors want to raise the cost of hiring people in their states, they should create an Obamacare exchange. If they want more jobs in their state, they should not. It’s that simple,” said Jordan. The text of the letter is included below, and a list of signers is available here. The Supreme Court has ruled significant parts of the Medicaid expansion of the President’s health care law unconstitutional as well as ruling that the individual mandate violated the Commerce Clause and will therefore be implemented as a punitive tax on the middle class. This presents us with a critical choice: Do we allow this reprehensible law to move forward or do we fully repeal it and start over with commonsense solutions? The American people have made it clear that they want us to throw this law out in its entirety. As members of the U.S. Congress, we are dedicated to the full repeal of this government takeover of healthcare and we ask you to join us to oppose its implementation. Most importantly, we encourage you to oppose any creation of a state health care exchange mandated under the President’s discredited health care law. such a regulation. By refusing to create an exchange, you will assist us in Congress to repeal this violation which will help lower the costs of doing business in your state, relative to other states that keep these financially draining exchanges in place. State-run exchanges are subject to all of the same coverage mandates and rules as the federally-run exchange. Clearing the hurdles of crafting an exchange that complies with the 600 plus pages of federal exchange regulations will only result in wasted state resources and higher premiums for your constituents. Implementation of this law is not inevitable and without the unconstitutional individual mandate it is improbable. Join us in resisting a centralized government approach to health care reform and instead focus on solutions that make health care more affordable and accessible for every American. Let’s work to create a health care system of, for, and by the people, not government or special interests. Say NO to any insurance exchange in Oklahoma, whether state-based or otherwise. 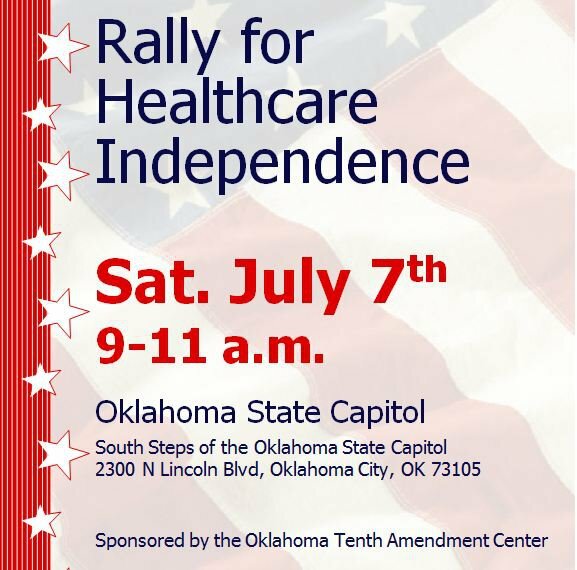 OK-SAFE, Inc. – Join Liberty Loving Oklahomans at the Oklahoma state Capitol on Saturday, July 7, 2012 from 9 am to 11 am for a Rally for Healthcare Independence. “Oklahoma City, Oklahoma- On Saturday, July 7, 2012, 9-11 am, The Oklahoma 10th Amendment Center, in conjunction with numerous other like-minded activist groups and individuals, will gather for a Rally for Healthcare Independence on the south steps of the Oklahoma State Capitol. Following the Supreme Court’s decision last Thursday that upheld the most onerous portions of the Patient Protection and Affordable Care Act (PPACA), including the individual mandate – liberty-loving Oklahomans once again find themselves at the losing end of Washington, D.C.’s continued big government policies. Now that the Federal Government has been given the power to force individuals to buy health care insurance, into what other actions will individuals be coerced under the guise of a tax? In 2010, Oklahomans overwhelmingly supported State Question 756– The Oklahoma Health Care Freedom Amendment – which, among other things, prohibits making a person participate in a health care system. Our state has spoken on this issue. Last spring, Oklahoma, along with the states of Louisiana, Florida, Nebraska, Alabama, Georgia, Indiana, Kansas, Missouri, Michigan, South Dakota, Texas, Virginia and Wisconsin refused to implement the Health Insurance Exchange plans inherent in the PPACA. Again, our state has spoken on the issue. Attendees of Saturday’s rally will have an opportunity to hear speakers who can educate them in some of the many ways Oklahoma citizens and legislators can band together to continue defending individual liberties. All Oklahoma legislators are invited to attend in order to assist and address their concerned constituents. Join us, won’t you? And invite your legislator and ask them to commit to opposing “Obamacare” in Oklahoma.